I like to keep a tasty dip on hand in the refrigerator. That way I always have something at the ready to offer a drop-in visitor. It also helps to keep hungry family members at bay when dinner isn't quite ready, but stomachs are grumbling. 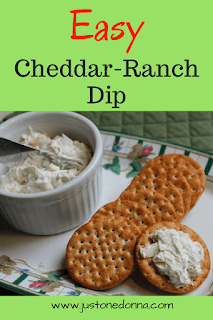 This cheddar ranch dip is easy to make, packs a lot of flavor and keeps well in the fridge. Have you priced pre-made dips in the store? Yes, they are convenient, but it is much easier on your budget to whip up this easy dip yourself. 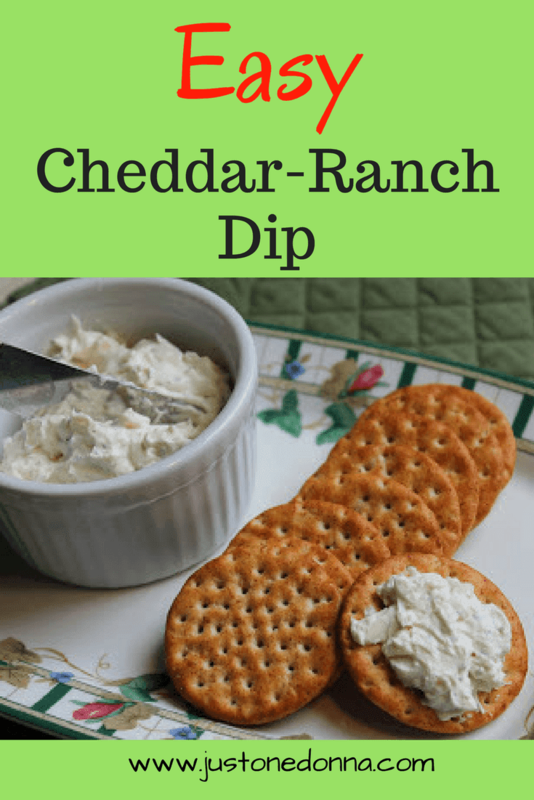 The flavors in this dip come from a packet of prepared ranch dip seasoning. I don't usually rely on pre-made seasoning mixtures, but in this case the prepared seasoning mix makes this dip quick and easy to make. With just five ingredients you can have this dip ready to serve in five minutes. How easy is that? I prefer to use white, sharp cheddar cheese, but you can substitute yellow cheddar, if you prefer it. I like to shred a chunk of cheddar cheese myself because I prefer the consistency of the cheese when compared to using a packaged shredded cheddar cheese. 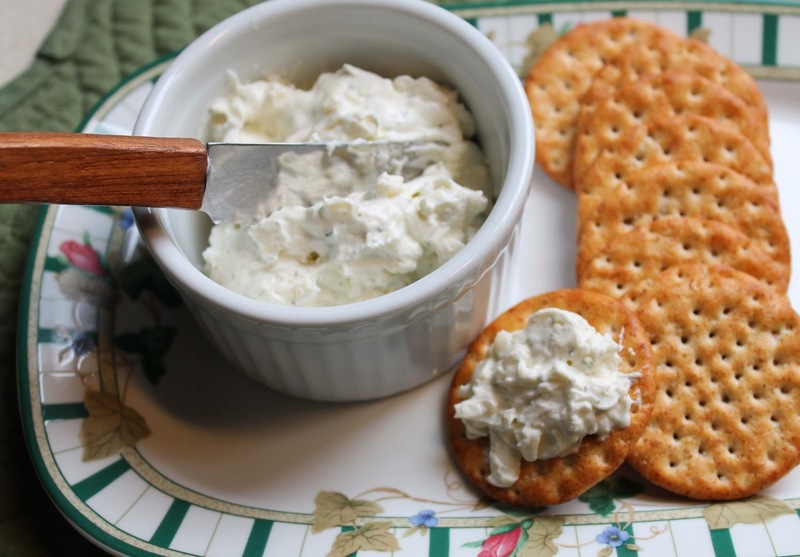 The buttermilk thins the cream cheese and adds a nice tangy flavor to the dip. If you don't have buttermilk, go ahead a use plain milk, instead. Adjust the amount of buttermilk depending on how thin you want your dip, For this recipe, I wanted more of a spread consistency. 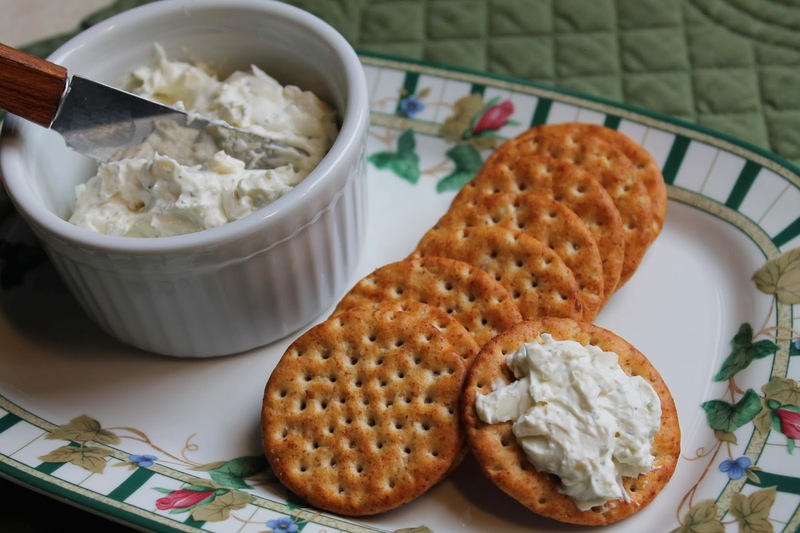 If you want to serve your chedar-ranch dip with chips, add a little more buttermilk to thin it a bit more. Shred the cheddar cheese using the large slots of a box grater. Place the cream cheese, seasoning packet, sour cream, and buttermilk in a medium bowl. Using a hand mixer, blend the ingredients together until smooth. Stir the shredded cheese into the dip using the mixer. Beat the ingredients together until the cheese is well combined. Chill the dip for a couple of hours to allow the flavors to combine. Serve with your favorite crackers. Shared on Meal Plan Monday. Get other yummy appetizer suggestions from my Appetizers Pinterest Board. Thank you for using the share buttons to share this recipe on Facebook, Twitter, Pinterest, and Yummly. I am thinking I could live off of this dip! It looks so good and would make the perfect appetizer for a party! Thanks for sharing the recipe.